PCB Drill Set - Heart Range A, (2 ea. #67, #60, #56, 1/16", 1/8"), 1/8 in. shank, 1.5 in. OAL..
PCB Drill Set - Heart Range B, (2 ea. #70, #67, #64, #60, 1/16"), 1/8 in. shank, 1.5 in. 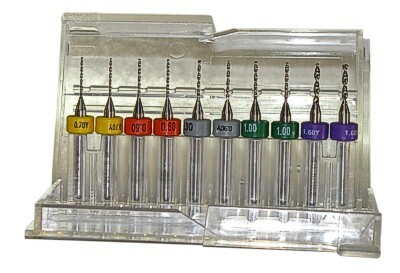 OAL..
PCB Drill Set - Metric Range (2 ea. 0.70mm, 0.80mm, 0.90mm, 1.00mm, 1.60mm), 1/8 in. shank, 1.5 in. OAL..